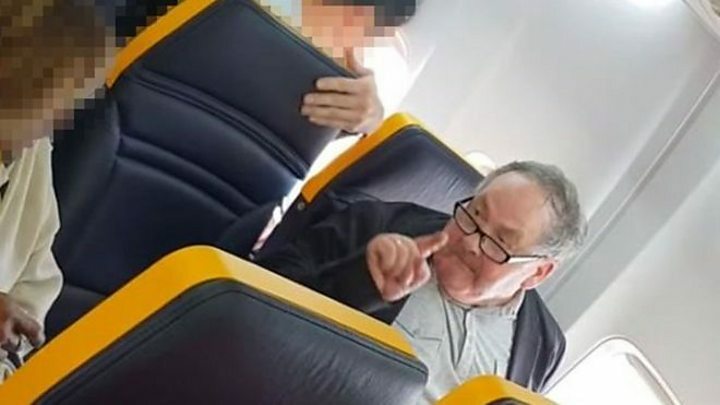 A Ryanair passenger who was filmed launching a tirade at an elderly woman on a flight has not had any charges filed against him. Essex Police said it had sought advice and presented what evidence it could to the Crown Prosecution Service (CPS). But, as the exchange took place in Spain, it said the CPS advised it had no jurisdiction to charge Mr Mesher. Essex Police said it was in touch with Spanish legal authorities about how to proceed. The Spanish authorities have been approached to comment. The tirade took place while the plane was on the tarmac at Barcelona Airport before the plane departed for Stansted. It was filmed by a fellow passenger and posted on social media where it racked up millions of views. In the footage, Mr Mesher can be heard using racial slurs to Delsie Gayle and threatening to "push" her to another seat. He shouts at her: "Don't talk to me in a foreign language, you stupid ugly cow." Previously, Mr Mesher, from Birmingham, told ITV's Good Morning Britain he was "not a racist person by any means" and it was "just a fit of temper at the time". A spokeswoman for the CPS said the police had not officially submitted a file to the service in order for it to consider a charging decision. "We cannot charge unless a file is submitted by the police", she added. "We conducted a thorough investigation and sought advice from the Crown Prosecution Service", a spokesman for Essex Police said. "They [the CPS] did not have the jurisdiction to advise on any charging decision. "We have completed our enquiries as far as we are legally able to, given that the incident did not happen within our jurisdiction, and are now in contact with the Spanish legal authorities so that they can determine how they wish to proceed." Previously, Robin Kiely from Ryanair apologised for the "regrettable, and unacceptable remarks" made to Mrs Gayle.